SUSAN A. POINT O.C., DFA., RCA., D.Litt. (1952–) is a descendant of the Musqueam people; she is the daughter of Edna Grant and Anthony Point. “I continue trying to push myself one step beyond my goals, or one step in a new direction so often. There is always another stride to make. My art is never really finished; there is just a point where I have to stop myself. This applies to my whole life; therefore my artwork is evolving all of the time. New situations, new experiences have always played fundamental roles in my art, an example is my sometimes-playful use of colour after a tropical retreat and my embraced understanding of my ancestral visual language. Thirty years ago I was re-introducing ancestral artefacts; I am now pushing my artistic boundaries in every contemporary sense. While, the most valued part of my artwork remains the same, my mark, and I leave this with every brushstroke, every- whittle of wood, every line that I leave, I insist is just the way I meant it. That is my signature. From the time when I pulled silkscreens on my kitchen table, I have stayed the course because my family helps me. All of my children are artists, and my grandchildren are too. Susan’s distinct style has stimulated a movement in Coast Salish art. She draws inspiration from the stories of her ancestors and commences the use of non-traditional materials and techniques, therefore inspiring a whole new generation of artists. Susan is an Officer of the Order of Canada, and has been presented with the Queen Elizabeth II Diamond Jubilee Medal for her contributions to Canada. She has been recognized with: an Indspire Achievement Award, a YWCA Woman of Distinction Award, a B.C. 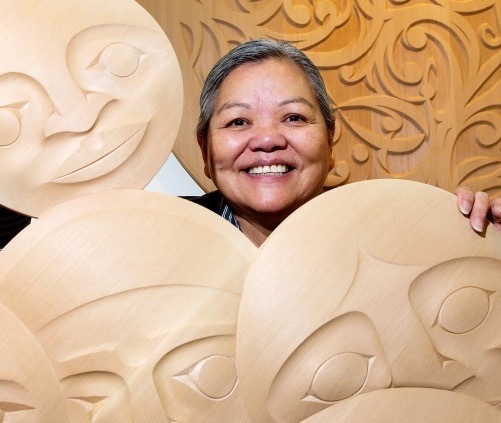 Creative Achievement Award, appointed lifetime member to the Royal Canadian Academy of Arts, was selected to the International Women’s Forum, was listed one of B.C’s 100 most influential women, and was one of Vancouver’s 2012 Remarkable Women. Susan has Honorary Doctorates from: the University of Victoria, Simon Fraser University, University of B.C. and Emily Carr University of Art and Design. Click to view Susan Point's art.